These cute, furry, little hippity-hoppity creatures actually can cause lots of damage in the garden and landscape. Rabbit and hare species abound throughout the country and, as billed, they breed like-well, you know. They live in tunnel systems called warrens and don't venture far to feed. Young shoots of peas, beans, lettuce, flowers, tulips, clover, and deciduous tree bark are all part of Peter Cottontail's menu. Luckily, once plants grow beyond the seedling stage, or trees develop tough bark, they are generally safe from bunny attacks. 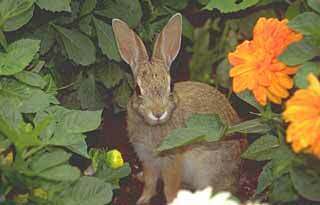 Look for cleanly cut leaves and stems to distinguish rabbit damage from insect or other animal damage. You can repel, trap, and fence out rabbits. Lure rabbits away from prized plantings by installing a patch of alfalfa or clover away from the garden. Protect young trees in winter with tree guards. Remove brush piles and tall grasses from around your garden where bunnies hide. Although some gardeners use a variety of repellents including human or dog hair, chili powder, blood meal, fish emulsion, and commercial products, the most reliable way to keep rabbits out of the garden is fencing.